If we didn’t convince you to give up your Ugg’s in favor of Anna Sui’s FitFlop boots, perhaps you’re willing to consider one-of-a-kind Uggs from Manolo Blahnik, Betsey Johnson, Stuart Weitzman and more. The boots are being auctioned today through December 14 with proceeds benefiting St. Jude Children’s Research Hospital in Memphis. Find them at Uggaustralia.com. 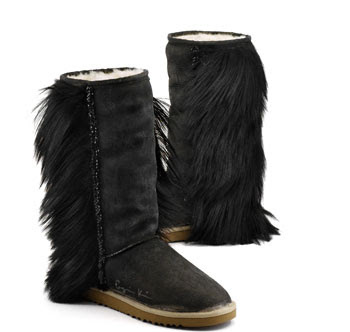 and the Rafe rocker Ugg’s.